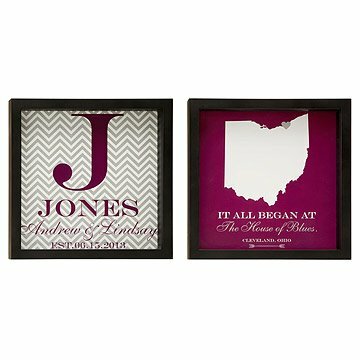 Commemorate the romantic place of your engagement, wedding, or first home with these matching artworks. Let your mind slip away to that special moment, where time, place and circumstance bring two special people together, adventures happen, and new journeys begin. Whether it's an engagement, wedding day or first home, artist Sandrine Froehle captures it elegantly. Paired frames illustrate the story in two ways: on one side is the silhouette of that special place, and on the other are the monogrammed names of the characters in that romantic tale. Perfectly suited to a wide range of decorative styles, these custom creations allow you to treasure a moment for a lifetime. Professionally printed on the finest photo grade matte archival Red River fine art paper with ChromaLife100+ inks. Frames made in China; graphics designed and printed in USA. Monogram print colors in the couple monogram and map set will mirror colors option chosen for the map. Each print comes ready to hang in a shadowbox frame. Love the two pics. Great design and delivered with care. Thank you! My wife absolutely loved the product. I gave it to her as a 5 year anniversary present (wood). This was a lovely surprise for my hubby on our anniversary. After 16 years of marriage we still fondly remember those first few moments in a far away land that we took interest in each other. I love the craftsmanship, the originality and the look of the piece. It is displayed for all to see because it's a bit of a show piece. When I received this set, the glass on both pieces was discolored. Looked sort of like an oil spill. I called customer service and sent a couple pictures. They quickly sent a new set out. 2nd time they were perfect! They look great on the wall! The bride and groom loved the personalized prints. With everything you get when first starting out things to hang on the wall is not usually one of them. The couple was thrilled to have something to show the start of their life together. The actual print is lovely and just as I expected. However, the frame arrived broken. The glass was intact so I believe the broken frame is due to the quality and not shipping. I immediately tried to call the customer service number which was a recording asking me to put in my "employee identification number." So I emailed the customer service. That was three days ago and I have yet to receive a response. I actually love the print and want to hang it in our den but it looks like I'll need to glue the frame back together first. Very annoying when you pay so much for a product. The product is great for any couple. It is a great conversation starter for new friends. It is a wonderful reminder of where it all began. My husband loved the colors, framing and has already hung them on the wall. He says it is was the perfect gift and meant so much to him. I loved the set and could not wait for him to open it. This item makes a great one of a kind gift.